Starting 11th of June, Belgium will be offering IDNs under the .BE TLD. 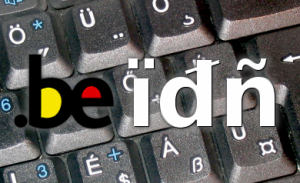 .BE IDN (Internationalized Domain Names) are Belgian domain names that may also contain non latin characters. Such Belgian domain names could contain accented letters or non-Latin characters outside the ASCII character set (a format that only uses ordinary letters, numbers or a hyphen). Trend to release IDN names makes the Internet more accessible while preserving a naming system that is globally unique and resolvable. Existing Belgian country code domains are going to continue to function as usual with new IDN country codes extensions created. Important information: There will be no Grandfathering, Sunrise or other pre-registration period. It will be a clear cut first come, first served type of launch. This means that even if you may hold the Belgian trademark and underlying .BE domain, corresponding to a certain .BE IDN, it does not entitle you to any advantage or prior right to register the IDN domain name. It is therefore important that you file your applications well ahead of the launch date, so that Web Solutions can apply for your domain name immediately when the registration opens up. The IDN covers a set of 33 characters that includes all possible accents and special characters in Dutch, French and German, as well as other European languages including Danish, Swedish, Finnish and Norwegian.